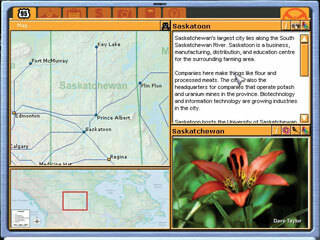 If you liked the original Crosscountry Canada, you and your students will love this new, updated version of the program. Your geography classroom becomes a real Canadian adventure! 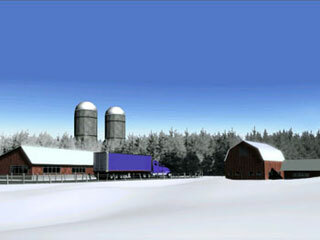 Students 'drive' an 18-wheel truck around the country picking up and delivering a variety of commodities. As students travel between any of 79 cities, they learn valuable skills such as problem solving, map reading, and decision making. 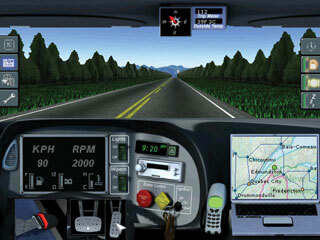 On-screen maps and a compass allow players to learn directions and plan the most efficient route. They'll learn time management, decide when to eat and sleep, and watch road conditions. Photographs of cities, famous places, and landmarks add a visual dimension to the journey. Descriptions and pictures of each of 50 commodities teach students the basis of the economy. Along the way, they develop geographical literacy. Students learn about the relationships between places, goods, and regions. In addition, they develop an understanding of their place in the context of this information. Crosscountry Canada 2 is engaging enough to keep students of all ages interested. The program is easily integrated into your multi-strand curriculum. 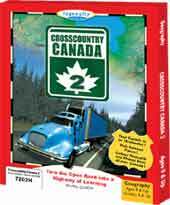 Crosscountry Canada 2 is a powerful tool for long-term learning, and it has a place in every grade 4 to 9 classroom.